1 DAY | ANABOX® DAY BOX The ideal pill organiser for one day! 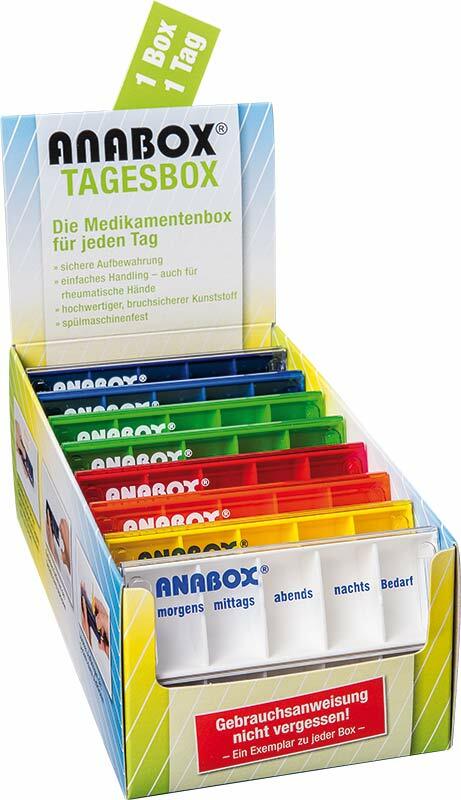 From the moment you get up until you go to bed at night, the ANABOX® Day Box provides orderly and handy storage for your medication. The left compartment of the pill organiser is slightly larger, making it easier to tell how the lid fits on the ANABOX® Day Box, whilst also providing extra space as the most medications often have to be taken in the morning. 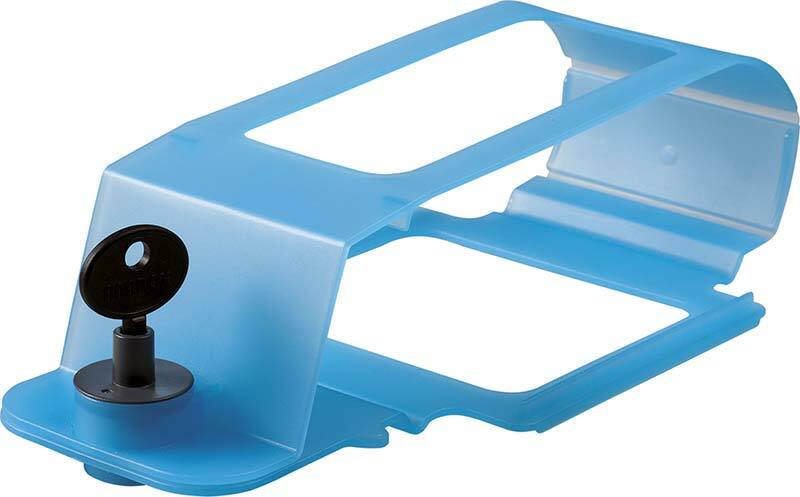 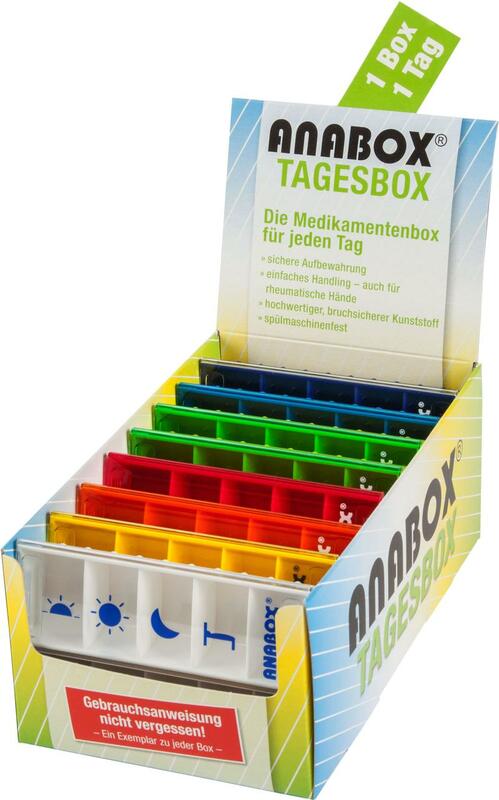 The lid of the ANABOX® Day Box can be easily slid open or simply lifted off. 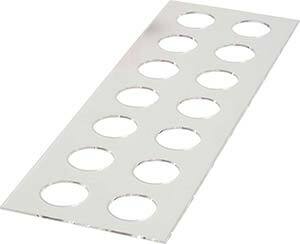 Then it can be simply slid over the lower part again. The ANABOX® Day Box is made of high-quality plastic and is dishwasher safe. 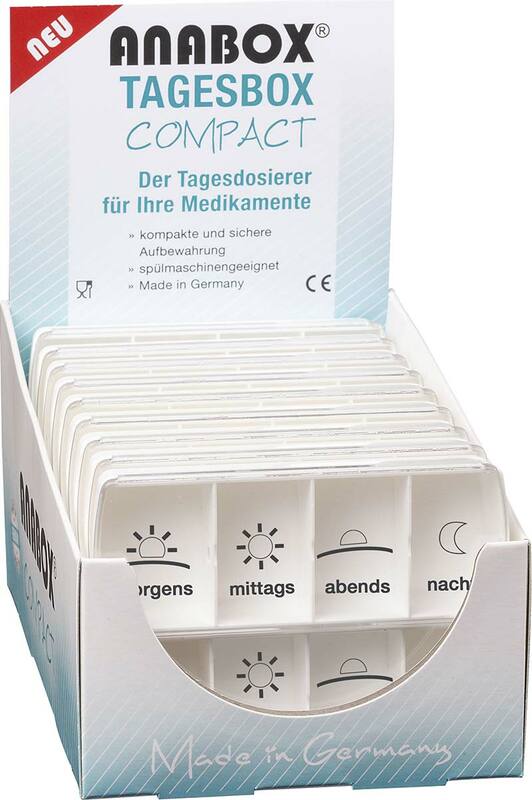 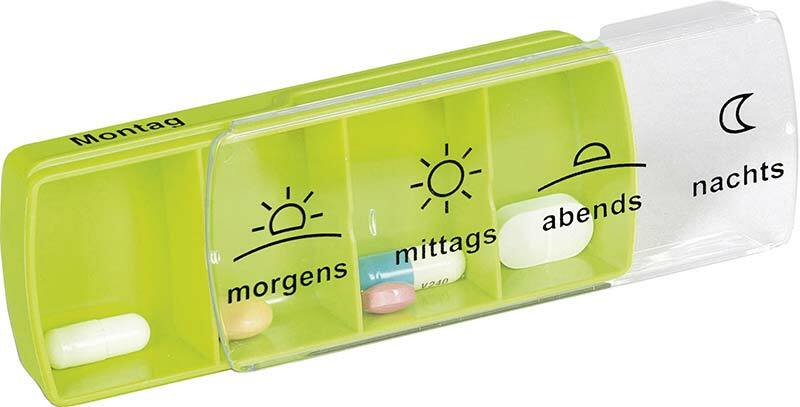 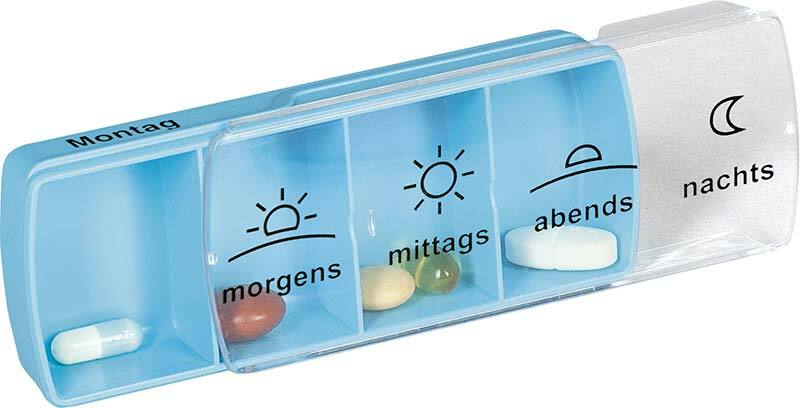 Dimensions of the individual pill organiser: 11.2 x 4.1 x 2.3 (L x W x H in cm) Using simple symbols, the ANABOX® Day Box PIKTO allows safe and reliable dispensing of medication throughout the day. 1 WEEK, 7 ORGANISERS | ANABOX® 7 Days The practical pill organiser for the whole week! 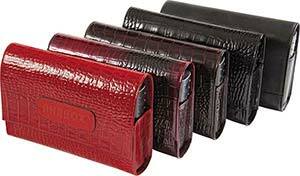 The ANABOX® 7 Days is available in many different colours. 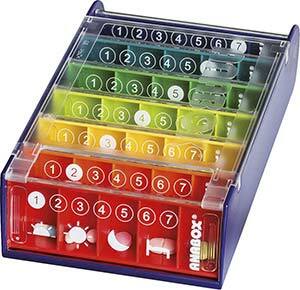 The included ANABOX® Day Boxes and the holder are dishwasher safe. 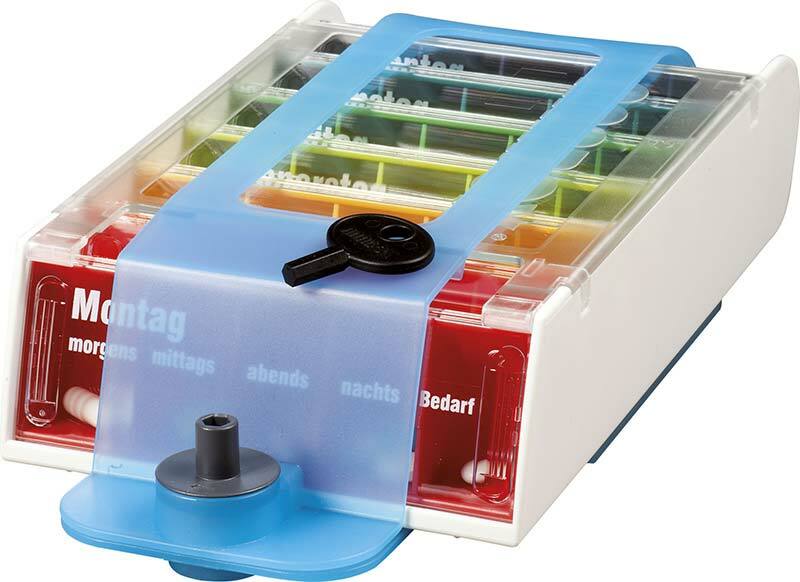 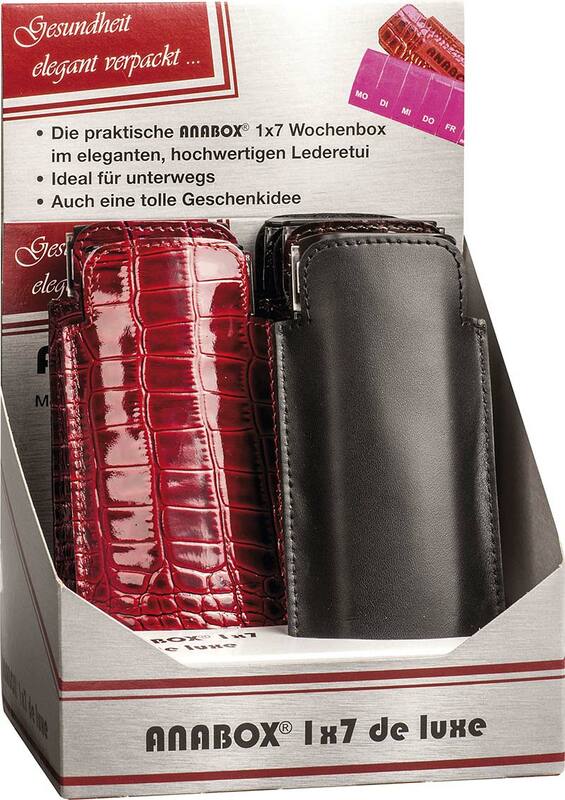 Like all ANABOX® products, the ANABOX® 7 Days is made of high-quality plastic and is manufactured in Germany. The lid of the ANABOX® Day Box can be easily slid open or simply lifted off. Then it can be simply slid over the lower part again. 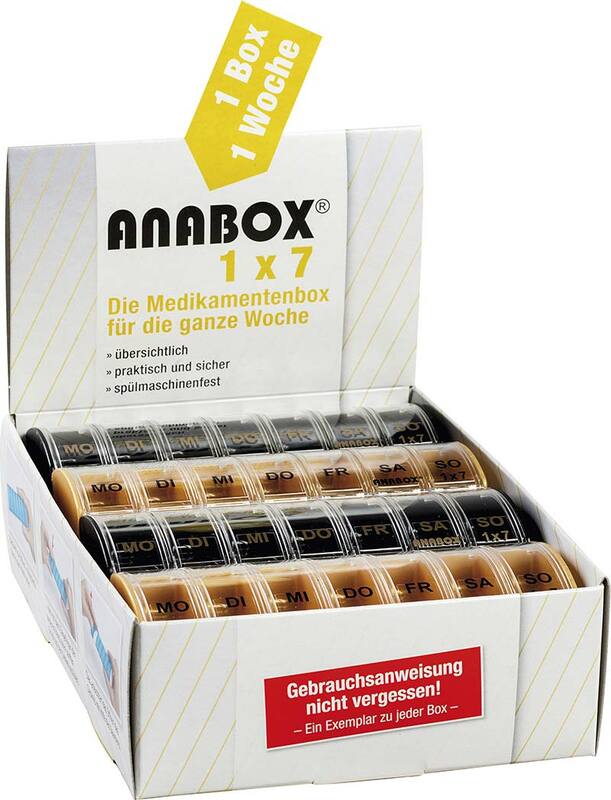 Ask your pharmacist about the ANABOX® 7 Days or the ANABOX® 7 Days COMPACT. 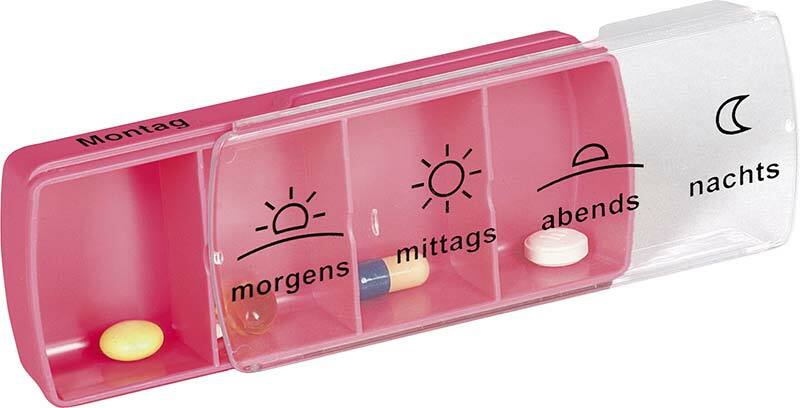 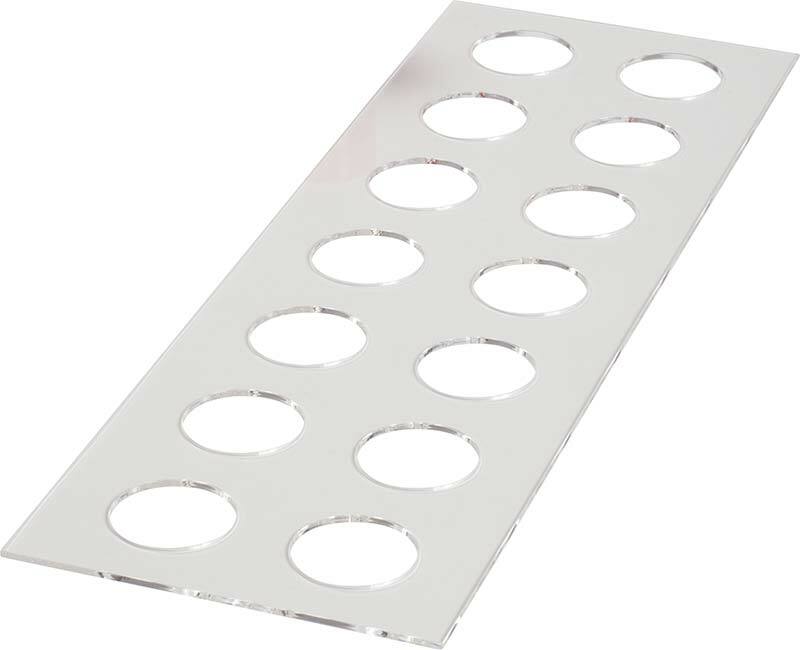 Dimensions of the pill organiser: 18.5 x 11.8 x 4.7 (L x W x H in cm) Light protection not 100 %, but only increased light protection through coloured lid. 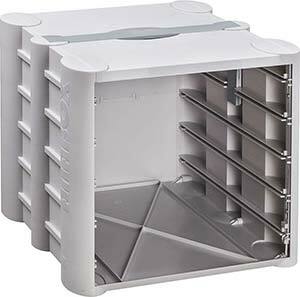 Dimensions of the pill organiser: 18.5 x 11.8 x 4.7 (L x W x H in cm) Using simple symbols, the ANABOX® 7 Days PIKTO allows safe and reliable dispensing of medication throughout the day. 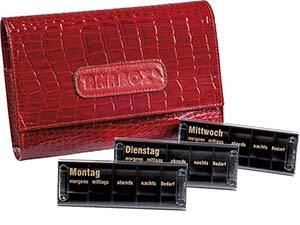 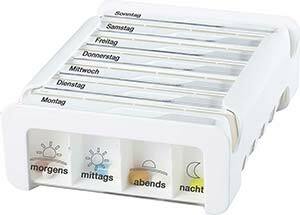 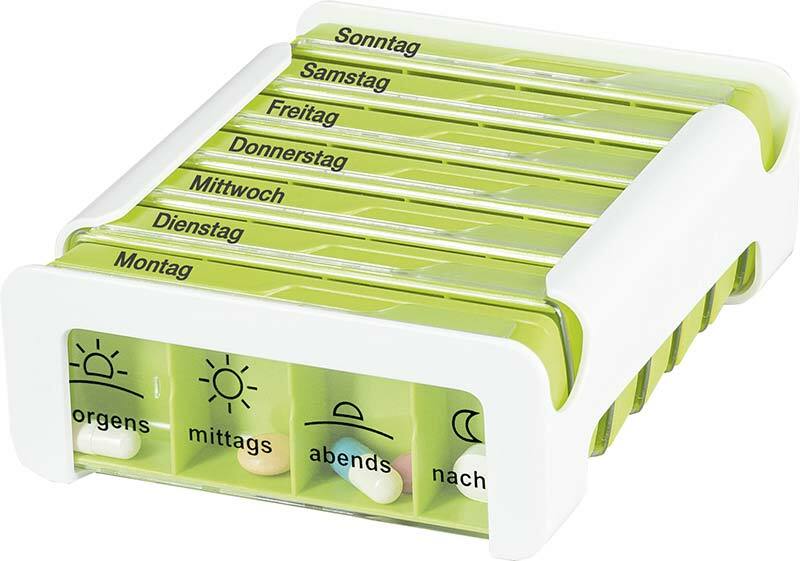 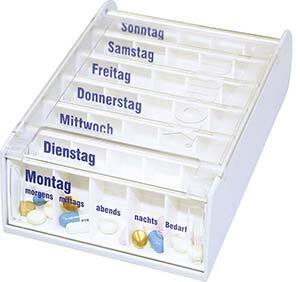 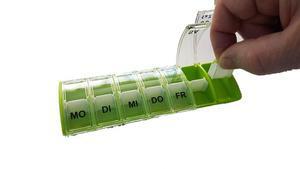 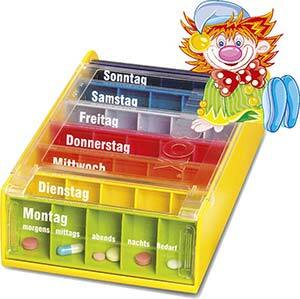 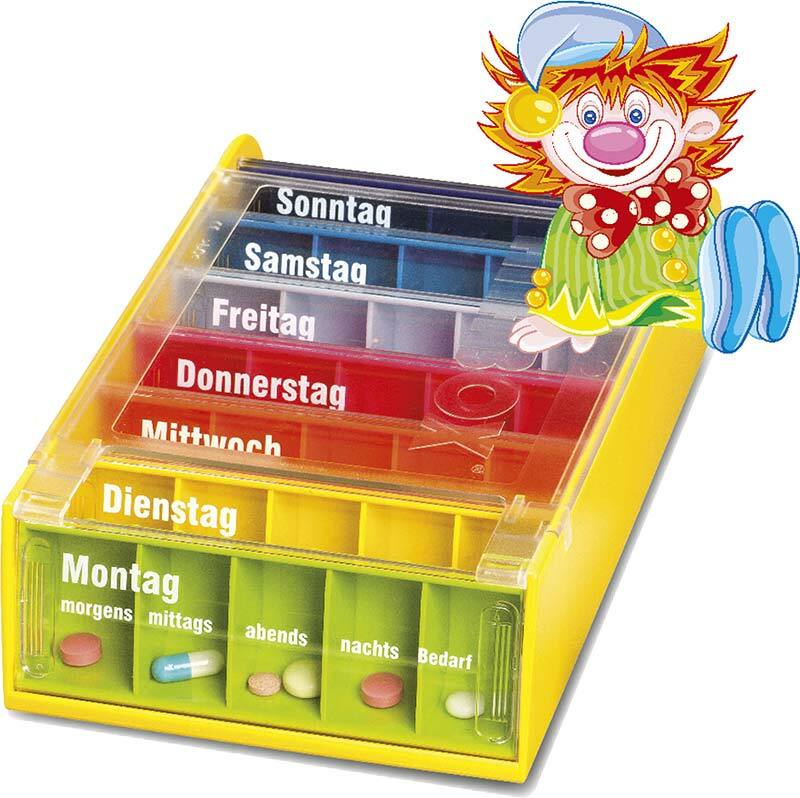 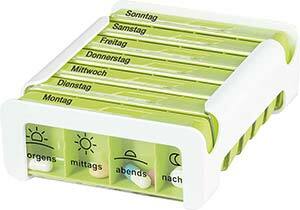 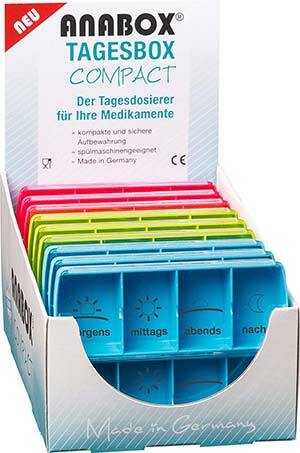 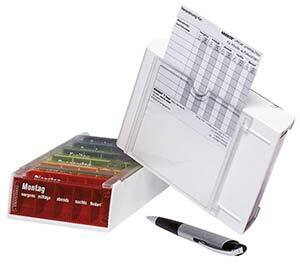 1 WEEK, 1 ORGANISER| ANABOX® 1 x 7 The practical pill organiser for the whole week! The handy ANABOX® 1 x 7 can be taken anywhere. 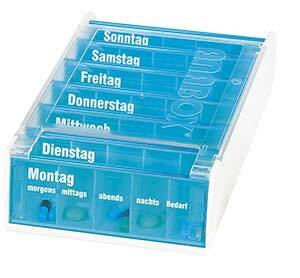 The medications are stored in seven compartments for an entire week. 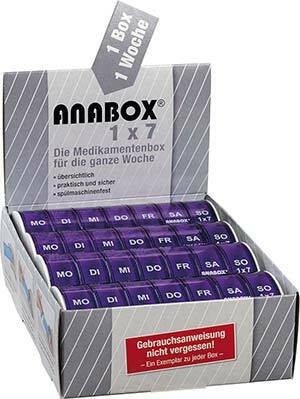 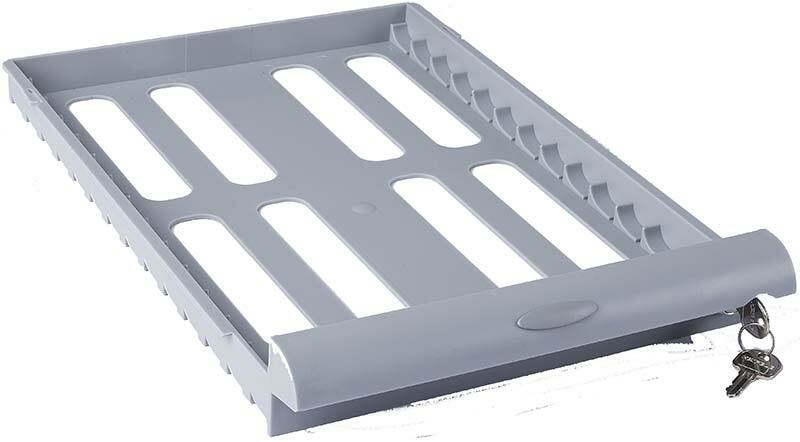 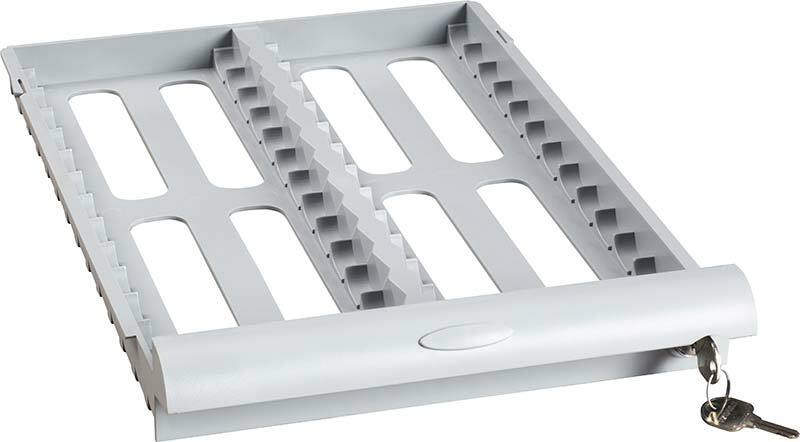 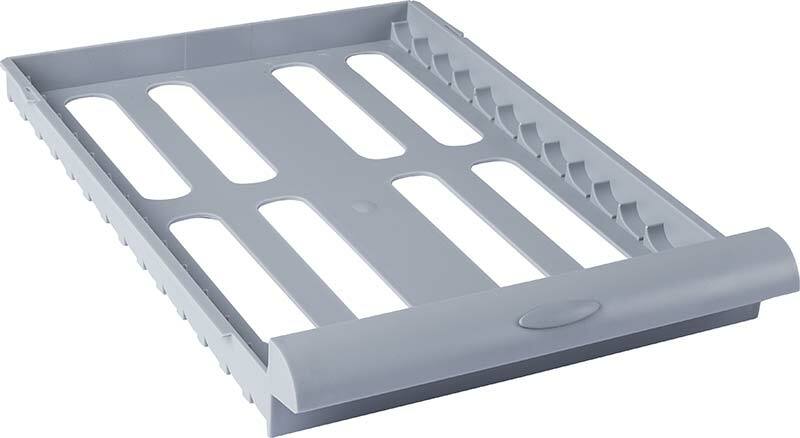 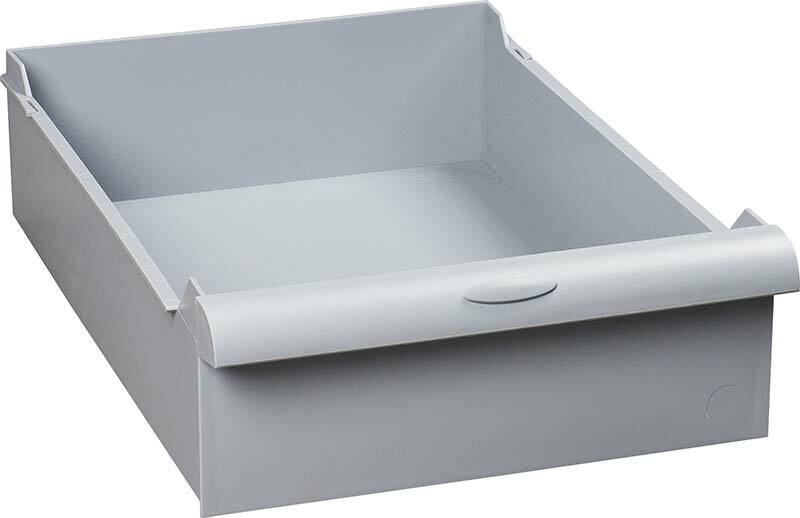 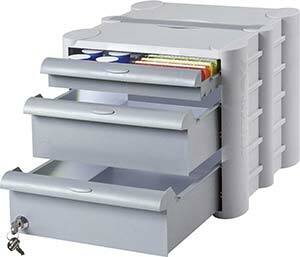 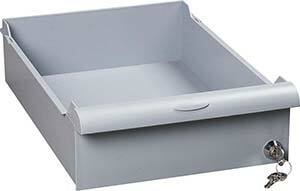 This makes the ANABOX® 1 x 7 ideal for the office, on holiday or on the move. 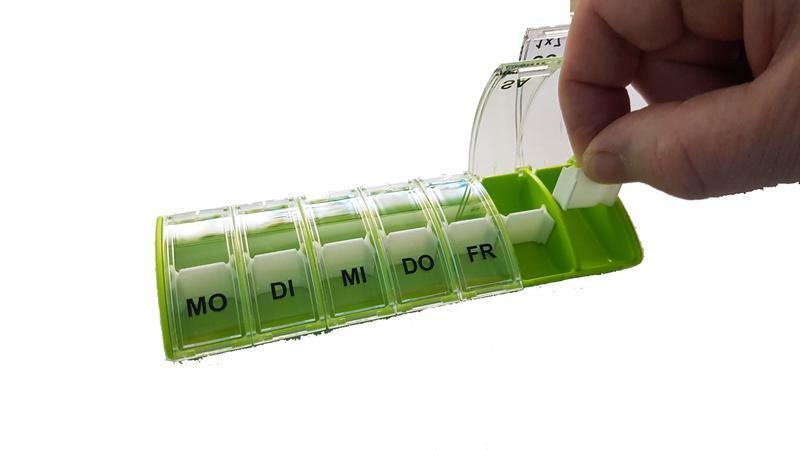 The individual compartments are tightly closed so that the pills cannot fall out unintentionally. To open the individual compartments, slight pressure on the upper point of the curvature of the corresponding lid is sufficient. 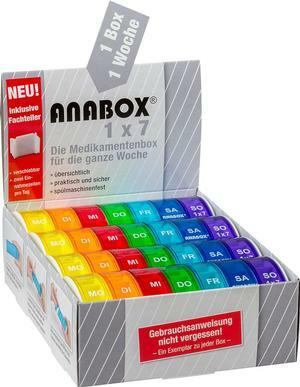 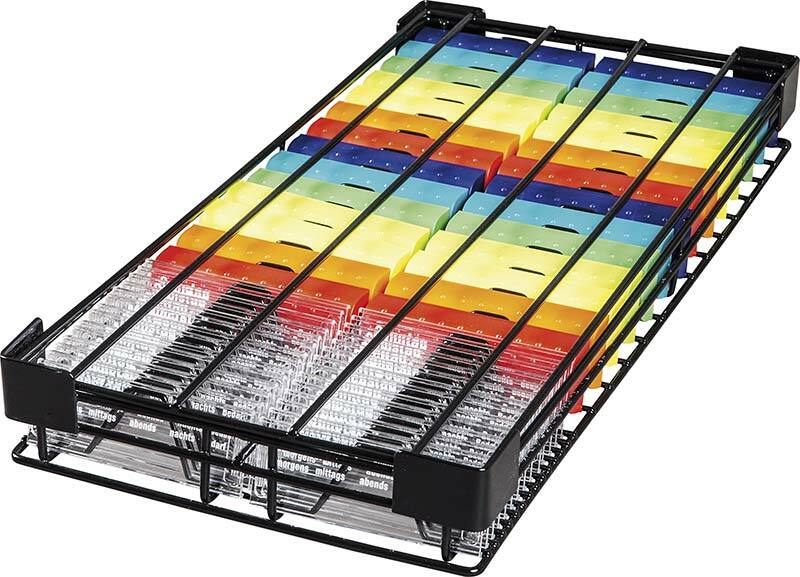 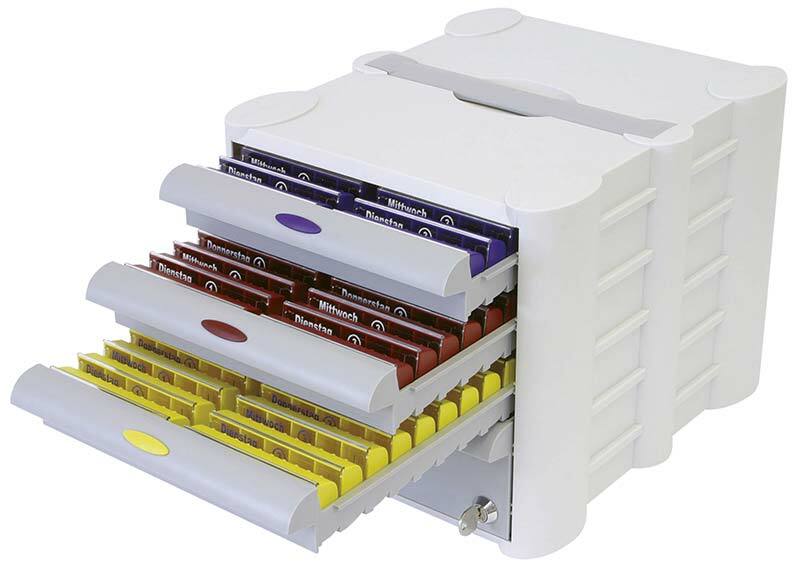 The ANABOX® 1 x 7 is available in many different colours! 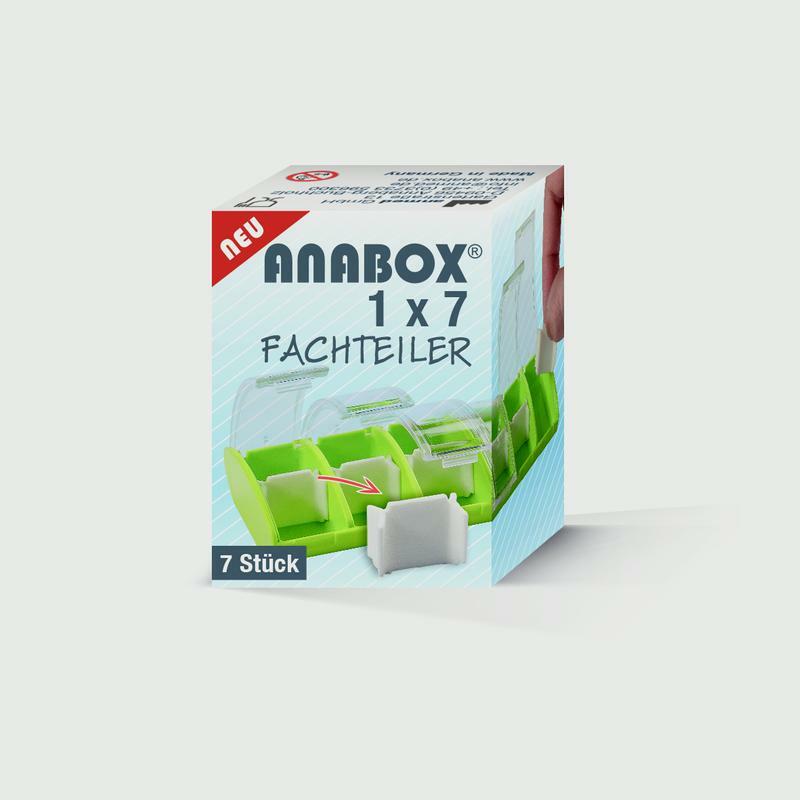 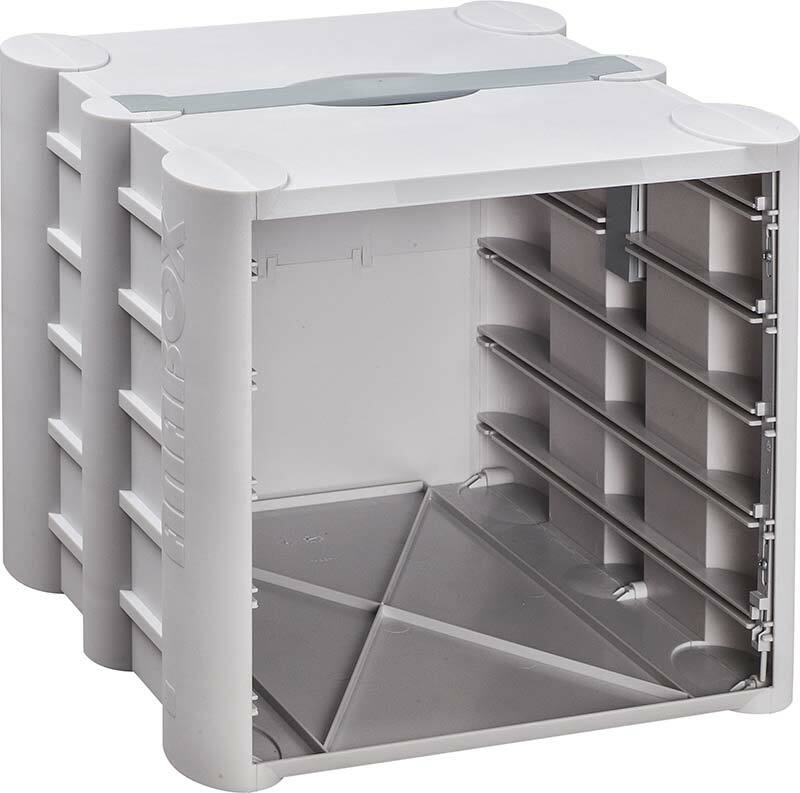 The ANABOX® 1 x 7 can be cleaned safely in the dishwasher. 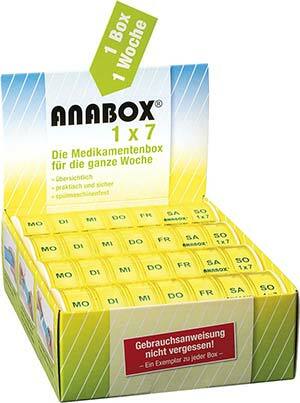 Like all ANABOX® products, it is made of high-quality plastic and is manufactured in Germany. Ask your pharmacist about the ANABOX® 1 x 7. 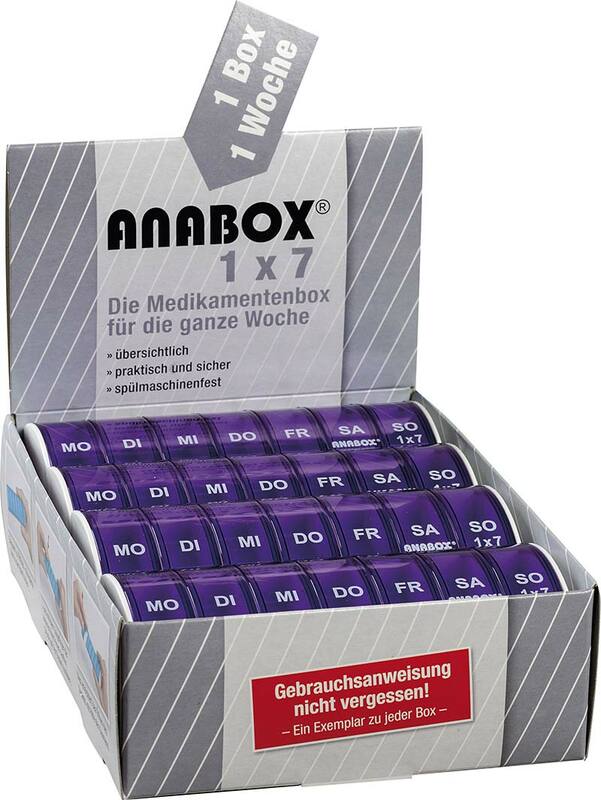 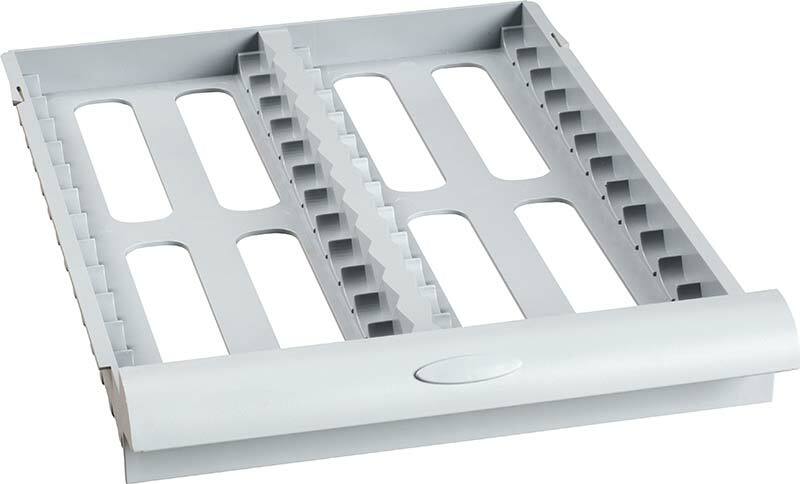 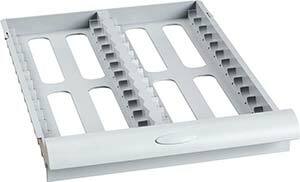 CARE RANGE | ANABOX® STATIONÄR Enough space for all your medication supplies! 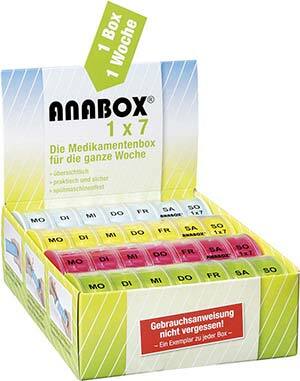 The ANABOX® STATIONÄR was specially developed for old people's homes and nursing homes. The complete ANABOX® series has been designed as a modular system so that a suitable solution can be found for every requirement. 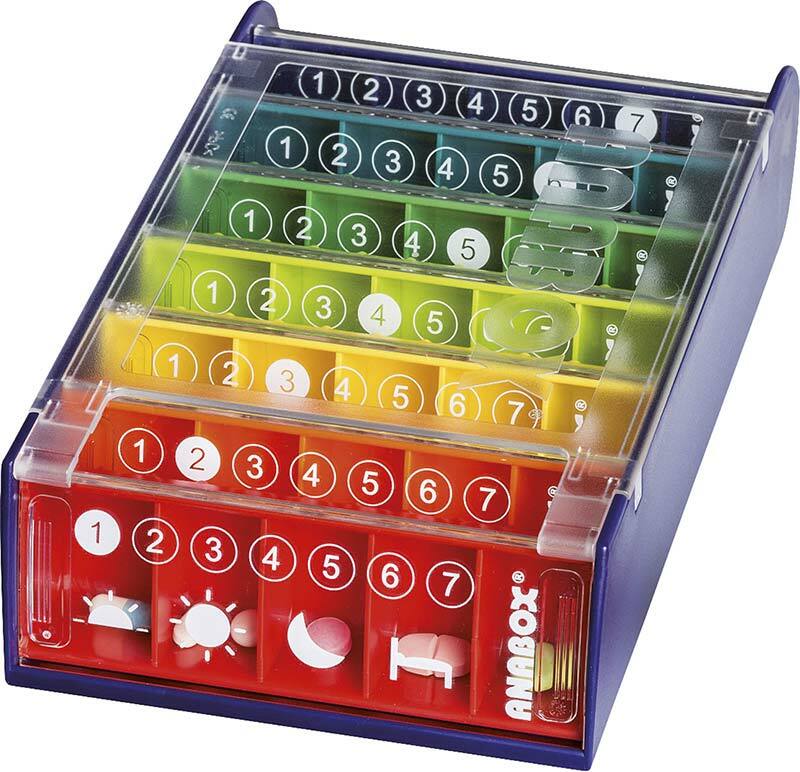 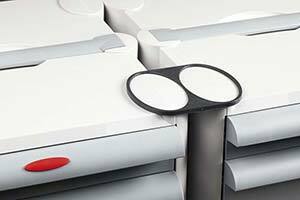 Whether colours, imprints or combinations of cups and ANABOX® Day Boxes, everything can be designed individually to suit your needs. 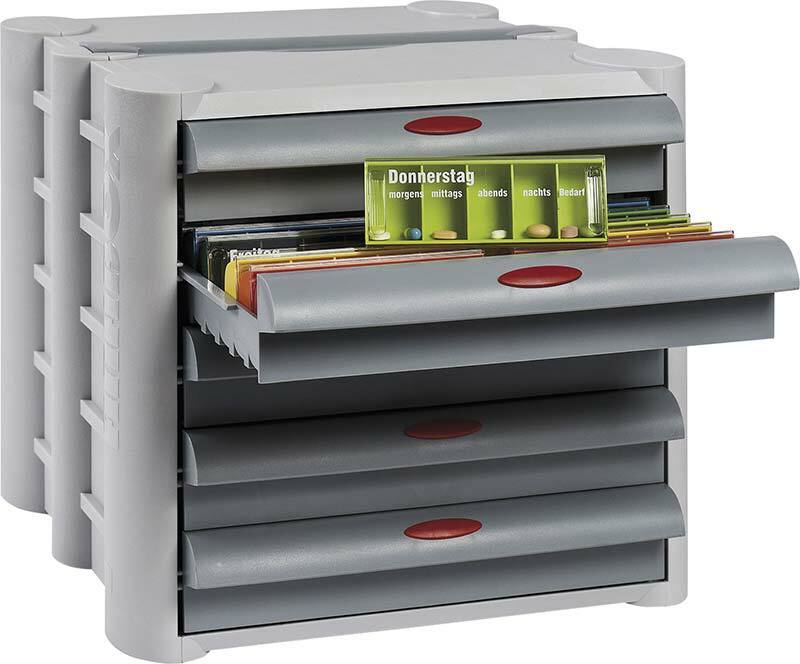 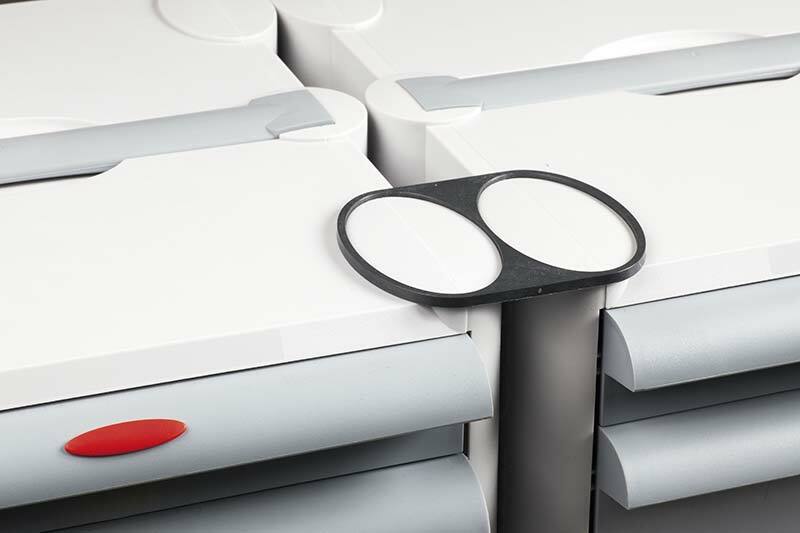 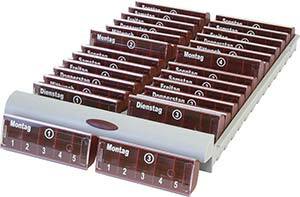 In the standard version of the ANABOX® STATIONÄR, the upper three drawers each contain 28 ANABOX® Day Boxes. 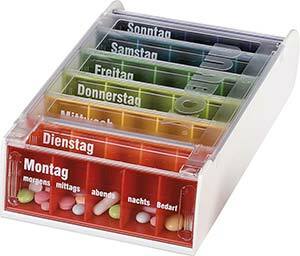 In addition, you can store any remaining medication or documentation in the large lower drawer. 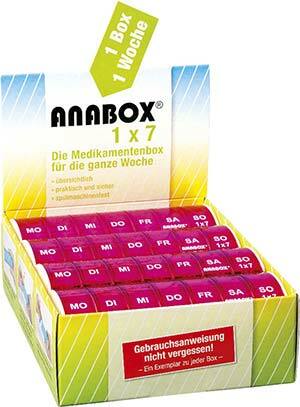 However, this can also be replaced by 2 small drawers, thus creating additional space for a further 56 ANABOX® Day Boxes. 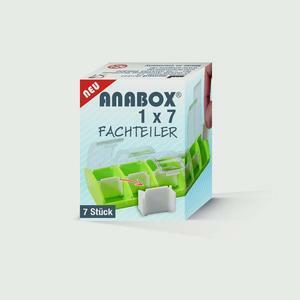 Like all ANABOX® products, the ANABOX® STATIONÄR is also made of high-quality plastic and thus meets the high demands of inpatient care. 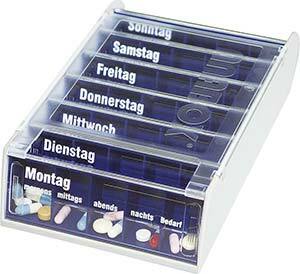 multi-purpose - old people's homes, mobile nursing services, home nursing, etc. 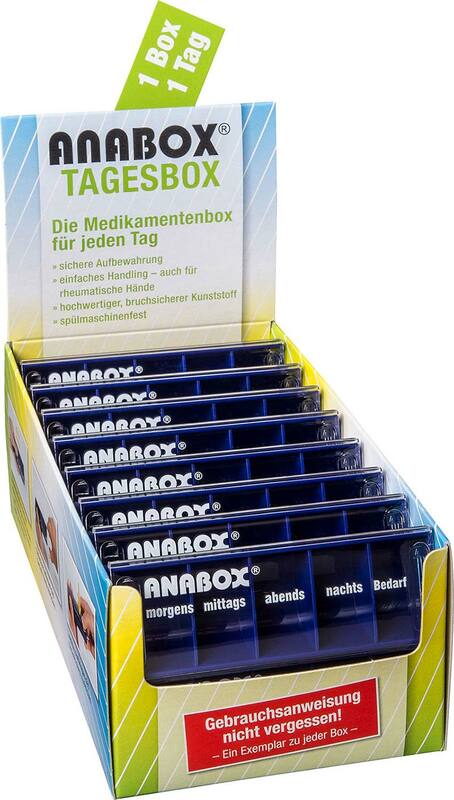 made of high-quality plastic - Made in Germany We would be pleased to provide you with more information about all possible applications of the ANABOX® STATIONÄR.